Crystals and Minerals | Educational school projects for budding geologists! Are you a budding geologist? And learn about amazing minerals! Discover the amazing qualities and features of minerals that make them essential for everyday living! Learn about all the different factors that influence the shape and growth of crystals and examine the special properties of carbon while constructing models of graphite and diamond! 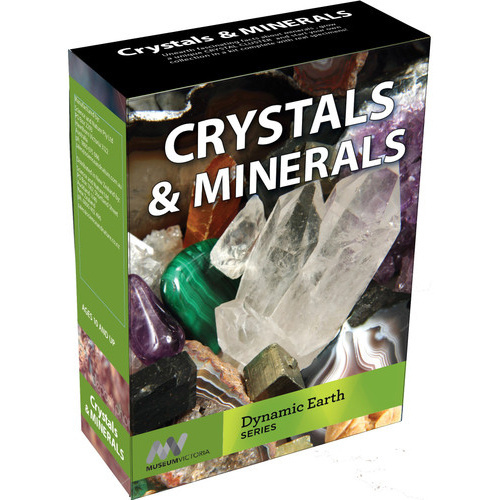 Discover a unique way to organise and catalogue your very own collection of rocks and minerals beginning with the samples of amethyst and pyrite included in this kit especially for you! You will learn all about crystals and how they grow, gold and how it is formed, and diamonds, the hardest mineral on Earth! - Full colour booklet with photo-storyboard instructions! Please read instructions prior to use. Recommended for ages 10 and over - adult supervision recommended.